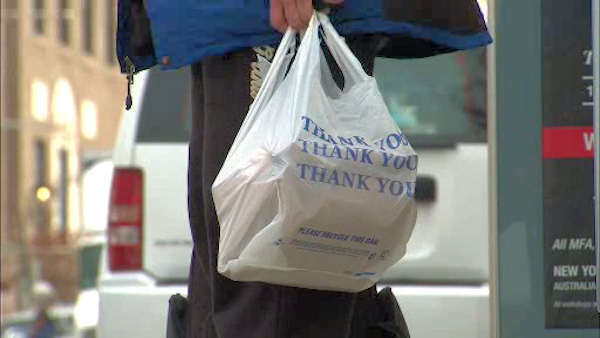 ALBANY, New York (WABC) -- Nearly a month after the New York City Council voted to approve a tax on plastic and paper shopping bags, the New York State Senate passed a bill on Tuesday that prevents cities all across the state from doing just that. The legislation, sponsored by Brooklyn Democratic Senator Simcha Felder, would block the 5-cent tax that was scheduled to go into effect on October 1 in New York City. Fines wouldn't start until April 1, 2017. "The last thing New Yorkers need is another regressive tax," Felder said. "I've been disgusted every time I've heard the absurd plastic bag tax legislation introduced. "This tax placed an undue financial burden on countless low- and middle-income residents who already struggle." The bill has been sent to the Assembly and will be voted on next week before it is sent to Governor Andrew Cuomo to sign into law.